Assault gloves with reinforced knuckles aren't listed as provincially approved weapons because they aren't weapons at all — they're part of the police uniform, Const. Daniel Montsion's lawyers argued in court Wednesday. The Ottawa police officer has pleaded not guilty to manslaughter, aggravated assault and assault with a weapon in the death of Abdirahman Abdi in July 2016. The Crown alleges Abdi died as the result of repeated blows to his head administered by Montsion, who was wearing a pair of the Oakley assault gloves. Gloves are a standard part of any police uniform, according to the Ontario policing standards and provisions. The only requirements are that they're black and that they allow finger movement, Montsion's lawyer, Michael Edelson, argued in court Wednesday, reading the section aloud. "Gloves are considered part of the uniform," Edelson insisted. The provincial standards place no restrictions on padding or reinforcement when it comes to gloves, Edelson said. 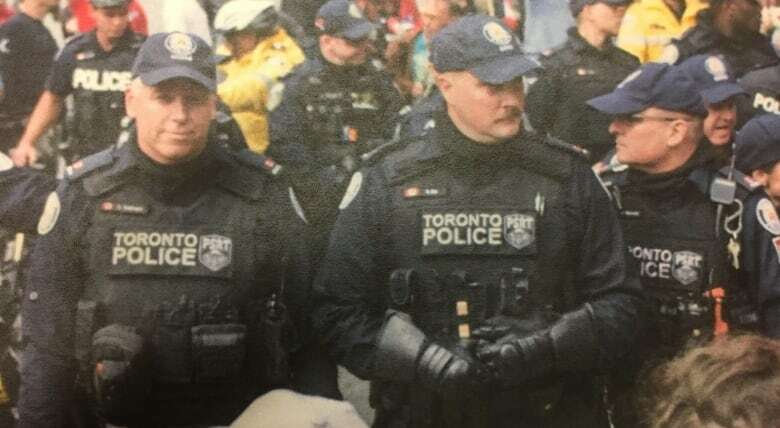 The gloves are not approved police weapons, court heard earlier this week from former Toronto deputy police chief Michael Federico, a use of force expert. Officers may use "impromptu weapons" in certain situations, Federico said, but that's considered an "intermediate" use of force, not a lethal one. An Ottawa police spokesperson confirmed to CBC in 2017 that the reinforced gloves are issued to some officers. In Toronto, the emergency task force has been using gloves reinforced with a "plastic moulding over the knuckle area" for more than 20 years, a spokesperson said in 2017. On Wednesday, Edelson showed the court a picture of a Toronto police officer wearing gloves with significant padding around the knuckles. "That would be considered part of an officer's personal protective equipment," Federico said. Police officers are trained to punch suspects if necessary, but are warned about the risk of injury to their own hands, Edelson said. An Ottawa police training document presented by the defence described punching as an "extremely prevalent method" of applying force. The document also describes how to make a fist to reduce the risk of injury to the officer. A seriously broken hand could be career-ending, Edelson proposed, and Federico agreed. Officers should avoid landing blows to a subject's head or groin whenever possible, Federico said earlier in his testimony. Federico's testimony is expected to continue for the rest of the week. The court also expects to hear from an expert on Ottawa police procurement practices, which might shed more light on why Montsion was wearing the gloves.